The latest version of Subtext allows writers to drag and drop Players to specific Throughlines. Whether a Group, an Individual, or a Relationship this ability to add more than one "vehicle" to contain the perspective of the Throughline makes it easy to track Hand-Offs and alterations in point-of-view. By assigning Players to Throughlines, the writer establishes the Role of that Player within the narrative. The first two are obvious placeholders: the former holds the perspective for the central character of your narrative, the latter holds the competing perspective needed to challenge the Main Character's emotional growth. The "mentor/mentee" placeholder is a stand-in for the central Relationship within your narrative--the relationship between the Main and Influence Characters. Feel free to adjust this, or for that matter, any of the default Players, in order to better serve your story. Players created in one narrative persist throughout ALL narratives attached to the same story. In this way, the writer can easily develop different narratives without having to continually re-enter the same Players over and over again. Lastly, the "characters" Player is meant to represent the group of characters holding the Overall Story Throughline perspective. The best way to obtain objectivity when it comes to the Overall Story Throughline perspective, is to think of the Players in that Throughline as "a group of" something. By taking this approach, the writer gains a greater distance and separation often needed when thinking of the more plot-level aspects of a narrative. 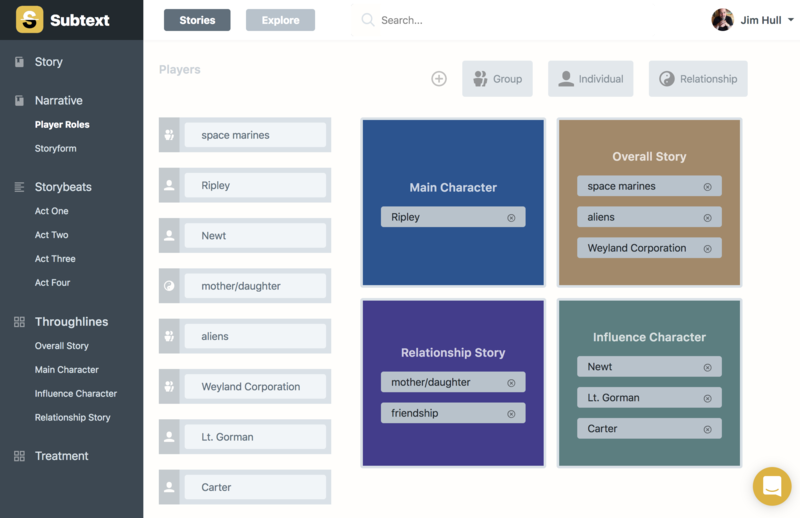 You'll find buttons to add each kind of Player to your narrative along the very top of the Player Roles view. Simply tap the type of Player you want to add, and Subtext obliges. Once added, you can easily adjust the label of the Player perspective by clicking on the item in the Player list to the left and making your changes. To assign a Player to a particular Throughline, simply tap the icon of the item in the Players list and drag that item into the box corresponding to the appropriate perspective. Both Groups and Individuals can be dropped onto the Main Character, Overall Story, and Influence Character Throughlines. Relationship Players can ONLY be dropped onto the Relationship Story Throughline. Relationships CANNOT be assigned to anything but the Relationship Story Throughline. Likewise, Groups and Individuals can ONLY be assigned to the Main Character, Influence Character, or Overall Story Throughlines. Subtext will remind you of this essential element of story by placing a RED outline around an incompatible Throughline. The ability to add more than one Relationship to the Relationship Story Throughline permits the writer to track the growth or development of the relationship from one emotional bond to the next. Note that Subtext automatically shifts the Throughlines to match their physical location with the model of the Storymind (i.e., a Main Character Throughline of Universe will appear in the upper left, an Overall Story Throughline of Physics will appear in the upper right). In order to remove a Player Role from a Throughline, simply tap the (x) next to the Role in question within the Throughline. Subtext will confirm, and if you agree, will remove that Role from the appropriate Throughline. In order to keep the story from breaking, Subtext will not allow the Author to delete the last Role within a Throughline—there must always be at least one Player maintaining the perspective of a Throughline. If you wish to permanently remove a Player from a narrative, tap the Edit button at the bottom of the Player list. Subtext will exchange the Player icons for the familiar red Delete icons. Simply tap the Player you want to remove, and after confirmation, Subtext will remove that Player.